The new iMac features stunning LED-backlit displays with a 16:9 aspect ratio, ideal for watching high definition movies and TV shows from iTunes®, or editing and watching your own videos or photos using iLife®. The new 21.5-inch iMac features a high resolution 1920-by-1080 pixel display. The 27-inch iMac features a beautiful 2560-by-1440 pixel display that offers 60 percent more pixels than the previous 24-inch model. Both 21.5 and 27-inch displays use IPS technology to deliver consistent color across an ultra wide 178 degree viewing angle. The iMac features improved graphics across the line with NVIDIA GeForce 9400M integrated graphics or ATI Radeon HD 4670 discrete graphics in the 21.5-inch model, and ATI Radeon HD 4670 discrete graphics or ATI Radeon HD 4850 discrete graphics in the 27-inch model. 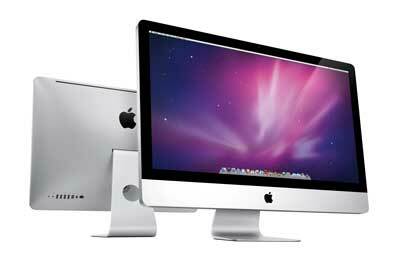 The new iMac line now also features 4GB of 1066 MHz DDR3 memory and capacity up to 16GB across four SO-DIMM slots. Every iMac features a built-in iSight® video camera, mic and stereo speakers integrated into the thin aluminum and glass design. iMac includes built-in AirPort Extreme® 802.11n Wi-Fi networking, Bluetooth 2.1+EDR, Gigabit Ethernet, a total of four USB 2.0 ports, one FireWire® 800 port and a new built-in SD card slot. Apple today also announced that the Mac mini, the world’s most energy efficient desktop,** is now faster, offers more storage and comes standard with double the memory. Starting at $599, the entry level Mac mini features a faster 2.26 GHz Intel Core 2 Duo processor and 2GB of DDR3 1066 MHz memory, a 160GB hard drive, five USB 2.0 ports, FireWire 800, NVIDIA GeForce 9400M integrated graphics and a SuperDrive®. The $799 Mac mini features a 2.53 GHz Intel Core 2 Duo processor, 4GB of memory and a larger 320GB hard drive. Apple now offers a $999 Mac mini that is specially configured with Mac OS® X Snow Leopard® Server. Mac mini with Snow Leopard Server features two 500GB hard drives for a total of 1TB of server storage in the tiny 6.5-inch square by 2-inch tall Mac mini enclosure. Every Mac comes with Mac OS X Snow Leopard, the world’s most advanced operating system, and iLife, Apple’s innovative suite of applications for managing photos, making movies and creating and learning to play music. Snow Leopard builds on a decade of OS X innovation and success with hundreds of refinements, new core technologies and out of the box support for Microsoft Exchange. iLife features iPhoto®, to easily organize and manage photos; iMovie® with powerful easy-to-use new features such as Precision Editor, video stabilization and advanced drag and drop; and GarageBand® which introduces a whole new way to help you learn to play piano and guitar. The new 3.06 GHz Intel Core 2 Duo iMac and Mac mini lines are now shipping and available through the Apple Store® (www.apple.com), Apple’s retail stores and Apple Authorized Resellers. The Intel Core i5 and i7 quad-core iMacs are available for order and will begin shipping this November. Mac mini with Mac OS X Snow Leopard Server is available from the Apple Store and Apple’s retail stores. *Based on estimated results of industry-standard SPECint_base2006 and SPECfp_rate_base2006 rate tests. SPEC® is a registered trademark of Standard Performance Evaluation Corporation (SPEC). Testing conducted by Apple in October 2009 using preproduction 27-inch iMac Intel Core i5-based 2.66 GHz units and shipping 24-inch iMac Intel Core 2 Duo–based 3.06 GHz units. Performance tests are conducted using specific computer systems and reflect the approximate performance of iMac. **Claim based on energy efficiency categories and products listed within the EPA ENERGY STAR 5.0 database as of October 2009.